The CHP says one person left the scene. 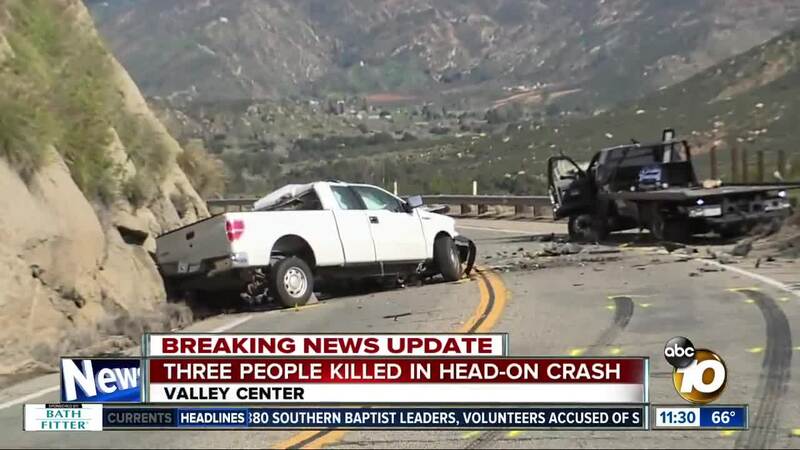 VALLEY CENTER, Calif. (KGTV) - The three men killed in a crash in Valley Center Tuesday morning have been identified. Authorities say Carlos Bravo Serrano, 30, Cesar Daniel Nino, 22, and Miguel Angel Saravia, 44, were killed when a pickup truck and a tow truck collided. The California Highway Patrol said a fourth man fled the crash on foot, telling officers he didn't have a phone with him, so he walked to a relative's home. CHP believes the man was a passenger in the pickup truck's front seat. The crash happened shortly before 6:15 a.m. on Valley Center Road between North Lake Wohlford Road and Paradise Creek Lane, according to the California Highway Patrol. CHP officials said a tow truck was on the northbound side and the white Ford F-150 truck was traveling southbound when both hit a curve in the roadway at the same time. The Ford, for reasons still under investigation, crossed over into the northbound lane and collided head-on with the tow truck. The tow truck driver was hospitalized with minor injuries. Investigators found beer cans and bottles spilled inside the truck, according to CHP Officer Mark Latulippe, who added the containers could have burst open during the collision. The northbound and southbound lanes of Valley Center Road at North Lake Wohlford Road were shut down due to the crash. &amp;amp;amp;amp;amp;amp;amp;amp;amp;amp;amp;amp;amp;amp;amp;amp;amp;amp;amp;amp;amp;lt;/iframe&amp;amp;amp;amp;amp;amp;amp;amp;amp;amp;amp;amp;amp;amp;amp;amp;amp;amp;amp;amp;amp;gt; City News Service contributed to this report.